Motifs are the building blocks the designer uses — usually in combination with a mitered outline — to create a pattern for the glass cutter. Some motifs — for example simple concave depressions that would be called bullseyes or punties today — date back to Roman times, while a popular motif, the pinwheel, was devised as recently as 1899. 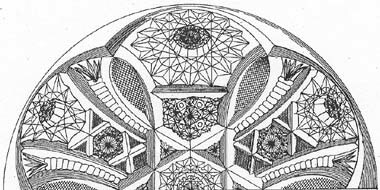 However, the majority of the motifs found on late nineteenth and early twentieth century cut glass — the glass that is widely collected today — were in use by the middle of the nineteenth century. As time passed, more and more of these motifs were combined into a single pattern, producing what has been called a “sampler effect.” Turn-of-the-twentieth-century patterns can often have as many as five or six distinctive motifs. An example from the American Midwest at the height of the brilliant period is given at the end of this file. 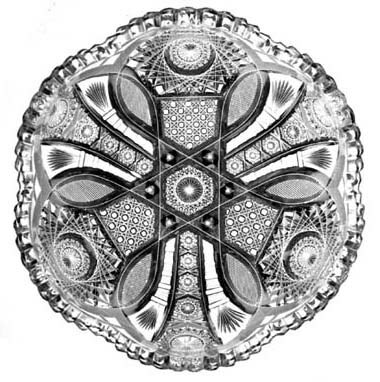 In his pioneering work that surveys the manufacturers of American cut and engraved glassware, A. C. Revi (1965, p. 176) mentions that Hawkes’ famous Russian motif/pattern is “formed by six sets of parallel lines.” The writer acknowledges his debt to this approach and has extended it to other “straight-line” motifs: diamonds, hobnails, cane, etc. It is hoped that this approach, together with the accompanying sketches, will help the reader visualize the number of sets of parallel miter cuts (“lines”) that are required for each motif. Few of us can readily visualize “six intersecting sets of parallel miter cuts” without a visual aid! For each motif in Motifs 2, the number of sets is stated. This is a necessary condition. But this number is not always a sufficient condition because some motifs also depend upon the spacing between the individual miter cuts that make up each set of parallel miter cuts. Sometimes only one motif is found on an item, and the name of the motif becomes the name of the pattern as well. A decanter, for example, with a body cut in the cane motif is referred to as being cut in the cane pattern. However, it would likely have additional, subsidiary motifs as well — perhaps a fluted neck and a star-cut base. Because of the lengthy history of cut-glass motifs, it is important to recognize that specific motifs will have been given different names in different countries at different times. The discussion here is focussed on American cut glass terminology which, in turn, is largely based on British and Irish nomenclature. In spite of many similarities, there are, nevertheless, a few important national differences. The writer has noticed a recent trend that substitutes newly-minted terms for those that have been in use for many years. New terms are to be welcomed, of course, and are often necessary, but only when they serve a valid purpose. There is certainly no justification for terms like “flashing,” when blaze or fringe is meant, and “flat star” when Brunswick star is the correct term (see, for example, Emmerson 2006). The re-naming of standard terms that have been in use for many years should be discouraged. The motifs discussed in this folder are based on those one is likely to encounter in references such as the ENCYCLOPEDIA OF AMERICAN CUT AND ENGRAVED GLASS by J. Michael Pearson (3 vols, 1975-77, privately printed) which is widely regarded as the standard reference for pattern identification based on cut-glass motifs. It should be used together with the Revi file. The period drawings of motifs scattered throughout this folder are taken from a c1890 catalog published by J. Hoare & Company that was reprinted in 1992 by the American Cut Glass Association. They have been enhanced for clarity by the writer who has darkened the main miter cuts. As previously mentioned, by the late 1890s American cut-glass patterns usually incorporated numerous motifs in their designs, the “sampler effect.” In the motif analysis of the following nappy, which is cut in pattern No. 400 by the Missouri Glass Company, six different motifs are identified. D = 9″ (22.8 cm), H = 2.5″ (6.3 cm), wt = 4 lb (1.8 kg). Sold for $200 in 1990. MOTIF ANALYSIS: Overlapping quasi-circular miter cuts produce vesicas that contain (i) strawberry (fine) diamonds. The circular figures themselves enclose, alternatingly, either a large 24-pt (ii) hobstar with a 20-pt (iii) Brunswick star on its hobnail and a pentagonal figure (“banner”) filled with (iv) cane, or a radial chain of Brunswick stars with a 24-pt Brunswick star at its outer end. Each chain of Brunswick stars is framed by a pair of (v) notched prism flares. The overlapping quasi-elliptical miter cuts also produce, in the center of the bowl, a six-pointed star figure that has tiny (vi) single stars in its points and a 24-pt Brunswick star in its center. The pattern’s name, No. 400, is found in the 1902 catalog of the MISSOURI GLASS COMPANY, reprinted by the American Cut Glass Association in 2004. The pattern was patented by W. S. Clark on 6 May 1902 (pat. no. 35,893); its patent’s drawing is shown below. The company’s catalog indicates that some examples of pattern No. 400 use the Russian motif on the pattern’s “banners,” as in the patent’s drawing, while others use the cane motif, as illustrated by the nappy above. It is not unusual to find minor variations such as this, even in patterns that have been patented.